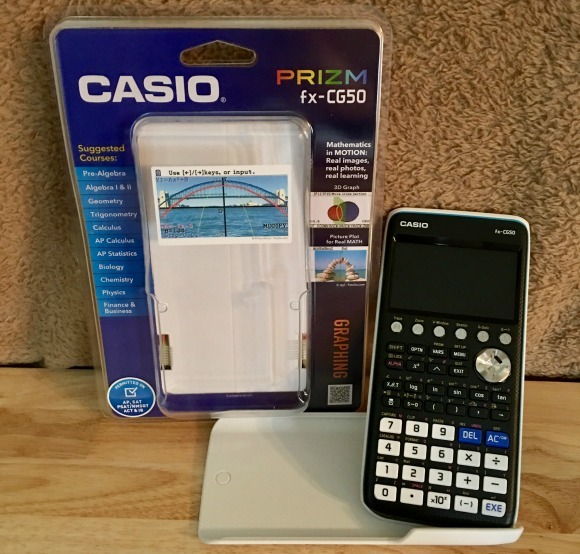 The PRIZM fx-CG50 by Casio is a new new graphing calculator. And that means lots of great new functions like 3D graphing, an improved catalog function, and a new case design to offer easier use. With the 3D graphing capabilities you can more easily draw 3D graphs such as planes, cylinders, and spheres, and view them from various angles. It still amazes me how far the calculator has come from when I was in school. I'm not going to say how long ago that was, but I will say we were just starting to get into advanced mathematics equation functions. I also have to say I like how easy it is to use. Your basic buttons are a little larger at the bottom so you have all of your primary calculator functions right there. Then you have the additional buttons a little smaller above those. This is definintely going to come in handy when my son starts college a year from now for sure! *As of October 7, 2010, for the pixel resolution and color reproduction of calculators. According to a survey by Casio Computer Co., Ltd.
**Using repetition of the following one-hour sequence: Menu display for 5 minutes, Run-Matrix mode calculation for 5 minutes, flashing cursor in Run-Matrix mode for 50 minutes. Based on default settings for display brightness and auto power off. (Refer to the Specifications for exact settings). That's pretty neat. I don't think I've ever seen a calculator quite like this one! I have always liked this brand. Growing up, Casio and TI were the only calculators around. I am always impressed by Casio and the products they make.